“NPR and Krem have reported that scientists at the University of Idaho have captured no less than two specimens of the now fabled giant Palouse earthworm. 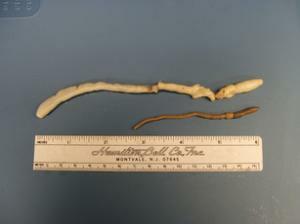 The giant Palouse earthworm (GPE) is a big white worm native to the Palouse prairie region of Idaho and Washington State. The worm was discovered in 1897, and was said to be abundant in the late 19th century, then they suddenly seemed to disappear. In fact by the 1980s the worm was thought to have gone extinct, and there were those who doubted that it had ever existed to begin with. That was until March 27, 2010, when scientist Karl Umiker and a graduate student made an amazing discovery on an unplowed patch of land. Umiker partially credits the discovery to a new tool at his worm-hunting arsenal — the “electroshocker.” After jolting the soil, Umiker dug around and managed to capture the worm that is now sitting in a freezer at the University of Kansas. Besides their immense proportions, other rumors that have swirled around these creatures for years, including the fact that they allegedly smell like lilies and — much like the notorious MONGOLIAN DEATH WORM — they can spit at potential predators. 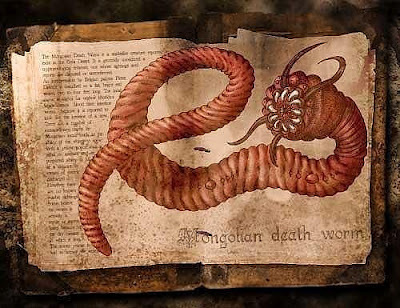 Although there is no direct connection to the Mongolian Death worm, the possibility exists that a weaker descendant exists and goes unnoticed. What we do have is a rather small (8 inches) while the fossil of this same creature is much larger.